Now I have a story about when I was born and how I ended WW2. Believe it or not my parents were very proud and happy to have a son "ME". They were so happy they got a photographer as soon as possible to take photos of myself. Well it just so happens the local newspaper were doing an article on war time babies born in 1945 so approached my parents to get permission to use my photo. Well my parents agreed and i appeared in the local newspaper. It went even further than that it got into the nationals and Churchill read the article. Now here is the interesting bit, he decided it would be a good idea to have thousands of the photo taken and dropped on a bombing raid over Germany. The raid took place and down fluttered all these pictures of myself. Hitler got hold of one , looked at it and decided that as I was so ugly bombing Britain was a waste it time. So he gave up and killed himself. That explains a lot ! 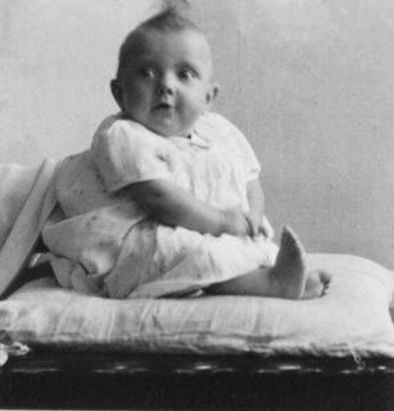 Here's me - I think I was about 6 months old.